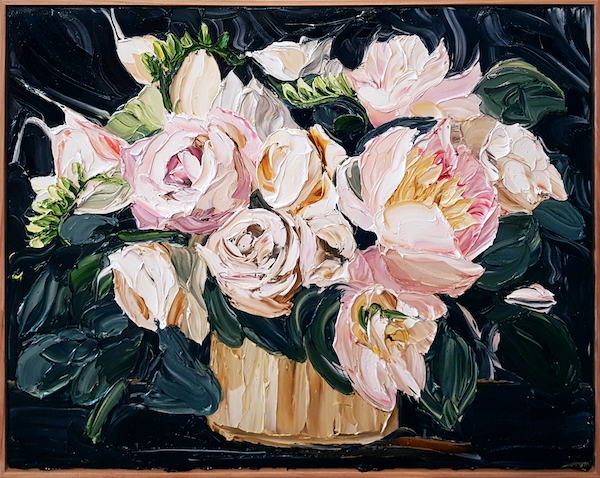 Jodie Wells, Polished Rose And Peony Bouquet, 2019. Oil on canvas, 90 x 112cm. Courtesy: the artist and Anthea Polson Art, Main Beach. Jodie’s art makes no attempt to capture flora and fauna as a naturalist painter might do. An intense involvement with the materiality of her oil medium lifts her imagery beyond mere representation. The instinctual energy of Jodie’s luscious markings radiates a direct, sensory appeal. We encounter nature in all its textural vividness through the gestural freedom and quality of her palette knife technique. The vitality of Jodie’s tactile surfaces offers an alternative way to respond to our own environments – to experience the pleasure in just looking and feeling without recourse to analysis.